"Here’s a never-before-seen lovely new weave: countless tiny triangles so small in scale one can hardly tell their geometric identity. The resulting texture is paradoxically subtle and conspicuous. Make sure you add this to your new-season roster for that ‘There’s something different about him’ je ne sais quoi." "Brand New, modern (yet timeless) ‘Triangle weave’ shirt made from 100% cotton, completely non-iron." Great quality shirts at a reasonable price. 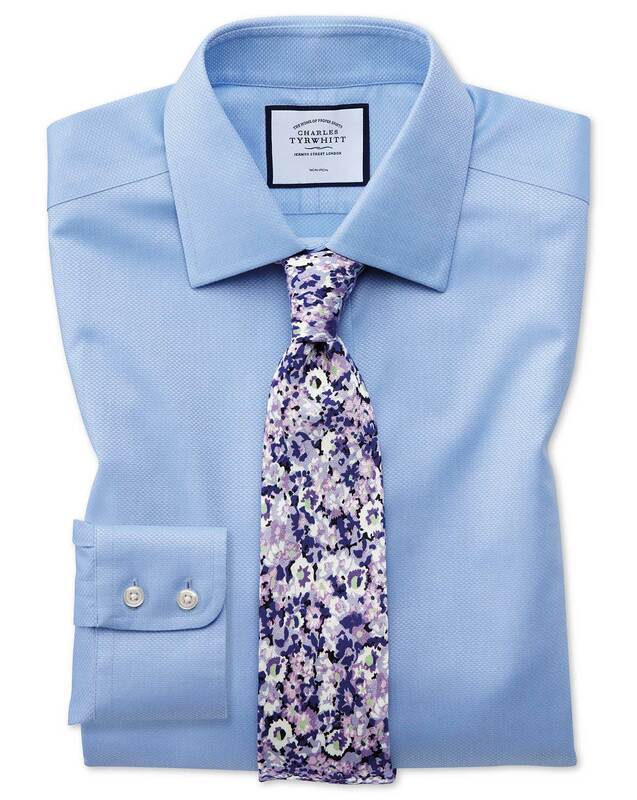 The non iron shirts look fresh all day. Response from Charles Tyrwhitt: It's always a shame whenever a customer's first order with us doesn't quite fit as expected, but I'm glad you have reached out to us rather than stay silent. The good news is we will always accept an item back under our no quibble 6-month guarantee, so please do raise a return for the longer 36" sleeve to be sent out to you. This can be completed online at www.ctshirts.com/rebound - a Freepost return label will be generated and replacements will be sent even before we physically receive the return back in the UK. When I lift my arms, the shirt pulls at the sleeve holes at the abdomen. I reached out, but never got a response. Response from Charles Tyrwhitt: We received an email from you on 17th February, which was responded to the very next day - so I'm certainly sorry if this wasn't received. Please double check your junk/spam folders to see if our email found its way there in error. In regards to your shirt, it is a real shame one of the three was not a suitable fit for you. As advised in our email, you are welcome to return this shirt to us online at www.ctshirts.com/rebound and we will gladly provide either an exchange or refund. Response from customer: That's interesting. I just reviewed my Inbox, Spam and Trash folders for Feb 17-21 and cannot find any responses from Charles Tyrwhitt or CTShirts, just advertisements. Could you please resend the e-mail? Thank you. Response from customer: Shirt was dropped off at the shipper today. We'll see what can be done to make it fit better. Thank you.